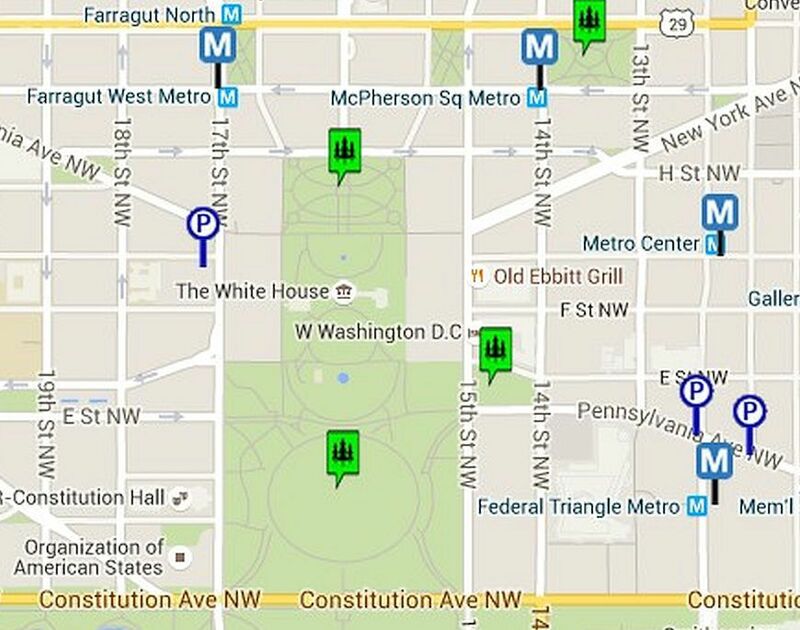 This map shows the location of the White House and the surrounding area with icons marking the closest metro stations and parking garages. The White House is located northwest of the National Mall at 16th St. and Pennsylvania Ave, NW. Washington, DC. The Ellipse sits directly south and serves as a public park and home to the National Christmas Tree. The White House Visitor Center is located in the Department of Commerce Building on the Southeast corner of 15th and E Streets. The area around the White House is blocked off from traffic for security reasons. There are limited places to park and public transportation is highly recommended. The closest Metro stations are Metro Center, Federal Triangle, Farragut West and McPherson Square. There is also a Metrobus stop located on the corner of Pennsylvania Avenue and 14th Street. See a larger map and driving directions to the White House on the next page. Public tour requests must be submitted at least three weeks in advance through one's Member of Congress. Tour participants gather at 15th and Hamilton Streets NW. for entry to the grounds and building. The nearest restrooms to the White House are in the Ellipse Visitor Pavilion (the park area south of the White House) and in the White House Visitor Center. Walk to the north side of the building in front of Lafayette Park to take photos in front of the White House or to participate in a public protest. The park is bounded by Jackson Place on the west, Madison Place on the east, and Pennsylvania Avenue. This map shows a larger view of the Downtown Washington DC area near the White House. Take a look and familiarize yourself with location of many of the area's attractions. From 1-95 South - Take I-95 South toward Washington to I-495 East. Follow I-495 to Route 50 West. Bear right onto L Street. Turn left onto 7th Street, NW and turn right on Constitution Avenue. Turn right on 15th Street. Follow 15th Street to the intersection of 15th and Pennsylvania Avenue. From I-295/BW Parkway South - Take I-95 South to I-295 South Baltimore-Washington Parkway. I-295 South will split at Route 50, which becomes New York Avenue. Stay in the right lane and then turn left on 7th Street. Turn right on Pennsylvania Avenue South. Follow Pennsylvania Avenue to the intersection of 15th Street. From I-270 - Take I-270 South toward Washington to I-495 South toward Northern Virginia. Follow I-495 to the George Washington Memorial Parkway. Cross the Theodore Roosevelt Bridge, staying to the right, and exit onto Constitution Avenue. Follow Constitution Avenue to 15th Street and turn left onto Pennsylvania Avenue. From I-95 North - Take I-95 North toward Washington. I-95 becomes I-395 when you cross I-495. Continue north on I-395. After crossing the bridge, exit US-1 North/14th Street. Follow US-1/14th Street to Constitution Avenue. Turn left on Constitution Avenue to 15th Street. Turn right on 15th Street at Pennsylvania Avenue. From I-66 - Take I-66 across the Theodore Roosevelt Bridge, staying to the right, and exit onto Constitution Avenue. Follow Constitution Avenue to 15th Street and turn left. Follow 15th Street to the intersection of 15th and Pennsylvania Avenue.